The U.S. Postal Service, or USPS, delivers more than 200 billion pieces of mail annually to homes and businesses. 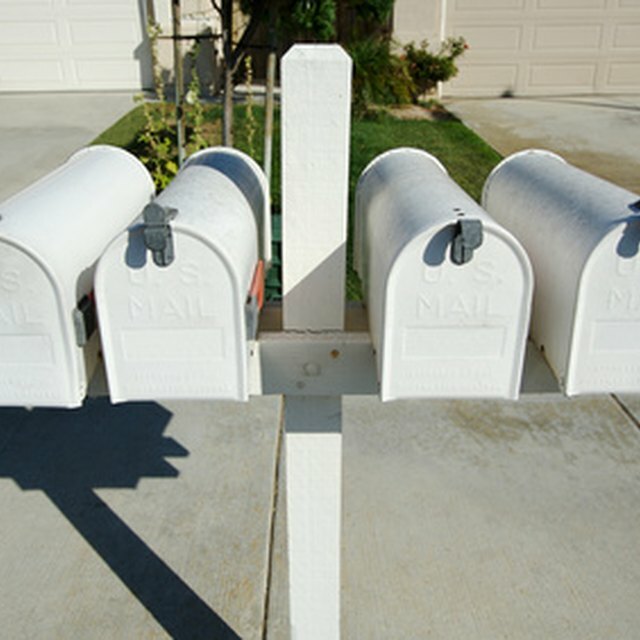 USPS carriers use a residential mail delivery system that includes mailboxes, neighborhood collection boxes and more than 38,000 post offices throughout the country. Residential mail delivery includes city delivery and rural delivery. USPS residential mailbox standards describe the requirements for mailbox installation. The standards apply to various kinds of delivery, including single and multiple address delivery points. The USPS defines an authorized mail depository as a letterbox or other receptacle used for the delivery of mail on a rural, city, highway contract or other route. Door slots and mail troughs and bins without locks, such as those used in apartment homes, are not considered letterboxes or private mail receptacles. U.S. postal code limits the use of authorized mail receptacles to delivery of postage-bearing mail. The USPS requires customers to maintain a clean and unobstructed approach to mailboxes. The mailbox, support and location of the mailbox for curbside mail delivery require approval by the local post office. Homeowners must also request permission to change the mailbox location. The name on the mailbox must be at least 1 inch high. The mailbox must be installed on the right-hand side of the road and in the direction the carrier travels if travel on the left side of the road violates traffic laws or poses traffic hazards. The mailbox should be set back from the road or curb edge about 6 to 8 inches. The mailbox must be installed with the bottom of the box at a height of 41 to 45 inches from the road surface if curb or road conditions allow. You may install a newspaper receptacle on the support post if it does not touch the mailbox, interfere with mail delivery or extend past the front of the mailbox when the door is closed. Homes that are authorized for door delivery must provide an approved house-mounted mailbox that provides security and protection for mail. If your house-mounted mailbox has a lock, it must have a slit large enough to accommodate daily mail. Homes approved for door delivery may choose to use door slots. The USPS provides requirements for the size and construction of door slots. What are the Rules for Mail Delivery? Manufacturers of wall-mounted receptacles intended for centralized use by multiple users, including those used in apartment homes, must receive USPS approval of the product. The USPS recommends contacting the local postmaster to learn how to choose and install appropriate wall-mounted, multiple-use mailboxes before making a purchase. Installation of proper receptacles is required before mail delivery can occur.